Joya Sherrill, who sang with Duke Ellington as a teenager, toured the Soviet Union with Benny Goodman and was one of the first African-American performers to host a children’s television show, died on June 28 at her home in Great Neck, N.Y. She was 85. 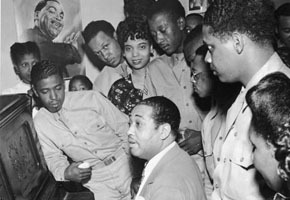 Pictured: Jazz vocalist Joya Sherrill, who sang with Ellington thorughout most of the 1940s, stands at center rear (she wears a pearl necklace). A poster of Ellington is on the wall, (Photo by Frank Driggs Collection/Getty Images).